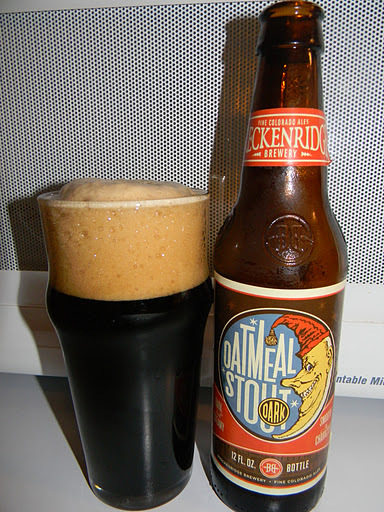 Review of Breckenridge Oatmeal Stout | Beer Apprentice - Craft Beer News, Reviews, Interviews and Info. Hi guys. For today’s craft beer review I’m going to be trying the Oatmeal Stout brewed by the Breckenridge Brewery located in Denver, Colorado. It’s been forever since I last had this brew. Several years I’m guessing. I remember liking it back then, so I hope my opinion hasn’t changed that much. Let’s get a bit of information on the Oatmeal Stout from the website, breckbrew.com. Rich, round and roasted, our Oatmeal Stout is satisfaction in a glass. It’s a bold, smooth-bodied concoction that oozes dark-roasted coffee aromas and flavors of espresso and semi-sweet chocolate. We round out these heady pleasures with a dose of flaked oatmeal for a creamy body and a semi-dry finish. This brew has an ABV of 4.95% and it comes in a 12 oz. bottle. The Breckenridge Oatmeal Stout poured a very nice, dark brown to almost black color with only a faint amount of ruby highlights glistening at the very bottom of the glass. The head was tan to khaki colored and of tremendous size due to my overly aggressive pour. It was a soft, fluffy, rocky, “milkshake” type of head that had better than average retention and left some “so-so” lacing behind. The nose on this beer brought forth tones of chocolate and coffee. A little bit of oatmeal, but it was quite relaxed to tell the truth. A touch of nuttiness that was lightly roasted along with a hint or two of smoke. The smell wasn’t bad, however it was just a little subdued and mellow for this type of beer I thought. The taste revealed more of the chocolate and coffee. I received a nice bit of bitterness along with some toasted grains and a smidgen of a walnut characteristic. A small morsel of cream brought about some additional sweetness. Overall, roasted, toasted and decent, but much like the smell…. just a tad soft and repressed from what I typically prefer from my Oatmeal Stouts. The mouthfeel was medium to thin bodied. Quite watery too. It was smooth and slick, but I just couldn’t get over how light it was for the style. Some flavor was left behind after the swallow, but not much really. I don’t remember the mouthfeel being this weak the last time I tried it. Well, this is an “ok” beer I guess. I think it would be a great introductory beer for anyone looking to explore the Oatmeal Stout style. It had plenty of the proper characteristics (slight as they may have been), it was easy to drink and it was not overly filling. This brew was not overly complicated nor was it a “world class” beverage, although I don’t think I would turn it down if it were offered. It went well with the cool day on which I sampled it that’s for sure. So, give it a try if you see it. It’s not bad, but don’t expect to have your socks blown. Have any of you guys tried the Breckenridge Oatmeal Stout? What did you think of it? Feel free to leave a comment if you would like. Great post. I was just looking at a few breckenridge vacation house rentals the other day. I can't wait to get there. I would love to try this beer. I also want to try breckenridge vanilla porter, I heard that was also amazing. Have your tried that one? What are your thoughts if you have tried it? Thanks so much for sharing Scott. First of all thanks for checking out the blog and thanks for the great compliment. Indeed I have tried the Vanilla Porter. Many times actually. You can find it on the right hand side of the blog under the label “Breckenridge”. You may have to scroll down a few posts, but it's on there. That is a list of all the Breckenridge brews I've tried thus far. Hope it helps you decide if you would like to try it. Be sure to check back in from time to time.